*Visit our new location, beside Visionworks Optical in New Town! We are easy to find, and our location has been specifically chosen to offer our patients convenience and value. Our offices are family owned, and operated by the doctor providing your care. 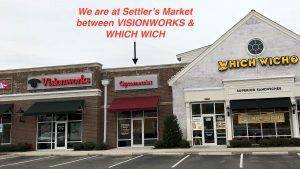 We have chosen to locate our latest office beside Visionworks optical in Williamsburg . Having a separate quality optical shop close by also allows your doctors to focus only on patient care, with the important tasks of fitting, producing, and dispensing your eyewear done by the professional opticians next door. And because our doctors have never made a penny from eyewear sales, we can offer you 100% assurance that you will only be prescribed what is necessary, and that our recommendations will be tailored to your specific needs…not to our bottom line. Call us today to make an appointment with Dr. Barley.